Danielle Rapp (2000 CHS Grad) with the first flag on the left. Hello. I just wanted to let you know how much I enjoy your web site and keeping us informed of all the events in Collinsville. I liked your coverage on the band. My girls were all in band and I still like to see how the band does at contests! My daughter Danielle was in the color guard and has continued that at college. She is now in the colorguard at OU. I thought you might like to include a picture sometime. 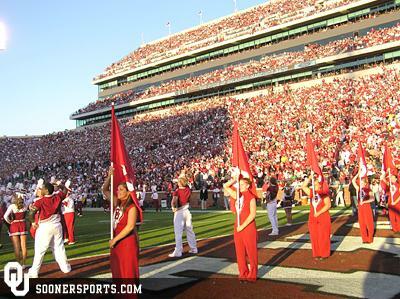 This was on soonersports.com. Danille graduated in 2000 and will be graduating from OU this December with a degree in elementary education. I'm glad to hear Emily is doing ok in Florida. Thanks again for your site and spending so much of your time. Thanks for getting pictures of olden day memories. As near as I can remember, the elevator was erected in 1945. I have some of the original issued stock certificates when the push was made to get the elevator built. Sixty years of history. The answer to the mini-mystery is a magnolia seed pod. Thank You, Mr. Wright, for all you provide to this website. It is great! We have 4 kids in Collinsville Schools and we appreciate all the great coverage of events they are involved in. You help keep us up to date on what is happening in our schools and community. Thank You!!! Checked your site for recent news of Sunday's animal shelter fundraiser. Good pic's. Thought event was a great success. Anxious to hear how much was raised. Sure they are well on their way to reaching goal of $20,000. Great to see how many hits your site is getting... keep up the good work!! Could you provide a link on the cvilleok website to our class website? www.chsreunion76.com. Also, thought you'd be interested in the following. Some background: the linked article appeared in World Magazine, July 23, 2005 and sparked some very fond memories. My note to the columnist and his response follows. Please let let Mr. Belz know how much I enjoyed his article "My Linotype" (July 23, 2005). My interest in type/font design began with a friendship long ago with the local newspaper publisher. The Wright family had been publishing the The Collinsville News (Collinsville, OK) since 1899 and Mr. John Wright was the owner/editor of paper when I met him in the early 1970's. I was an aspiring cartoonist and wandered into the newspaper office one day to see if they were hiring in their "art department." I quickly learned that there was no art department and that the majority of the employees were family members, expect for the photographer/classified ads lady. Although he couldn't give me a job, Mr. Wright invited me to return anytime to visit, which I did on a regular basis. Mr. Wright took an interest in me and ended up teaching me how to operate the linotype machine and line camera. Some time later, he even ran a story about me that included some of my cartoons. Some of my fondest childhood memories include the image of Mr. Wright sitting at the linotype, wearing his soiled printer's apron, as he set type for that week's edition. The newspaper building was an old structure that was built around 1910 with high ceilings, wood floors, etc. Wednesday was publishing day and the noise of the old offset presses, and the smell of the ink permeated the whole building. I loved that place! Thanx for stirring some cherished memories...and I hope you're able to find a new home for the linotype. Windshields may be bigger for a reason, but looking in the rearview mirror is not such a bad thing. Thanks for a warm and nostalgic note. I guess that every vocation indulges itself to a certain extent in such a manner, but old printers do it most literately! 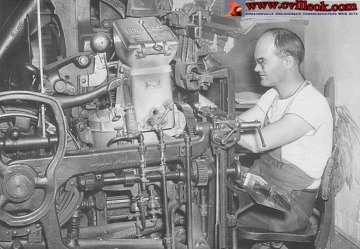 John Wright operating the Linotype at "The Collinsville News" in 1953.